I cannot believe that this music journey that started on Feb. 22nd, 2014 has finally come to a close ( for now!) . E.J. Lajeunesse boasts a beautiful theatre with plenty of room for audience and performers alike. The stage was so expansive that it was easy to fit all of us who were in the large HOPE IS band. Although we had a decent crowd of wonderful supporters they seemed dwarfed in an amphitheatre that seats 400! But I am so very very happy to say that our last concert was also a wonderful success and we had some lovely, moving comments about the night afterwards. I felt very good about the show and I am very pleased with the sound that Joe Collins at Polaris Studio provided. 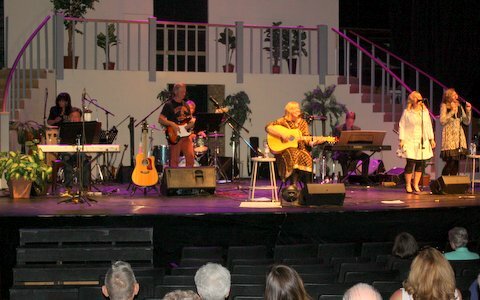 It was also so much fun to surprise my sister, Mary, with a spotlight on her own original music. 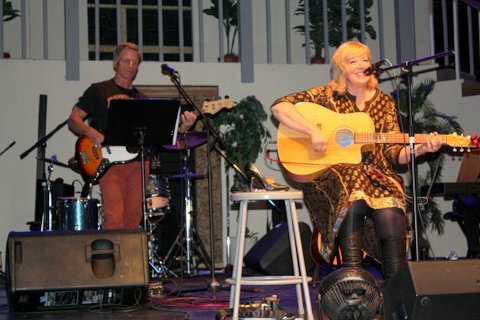 It was Mary’s 50th birthday that actual night so instead of playing one of my new tunes at the end of the first half …I asked Mary if she would mind performing one of HER tunes for us all. The band soon caught on to the music and Paula and I were able to assist with some impromptu backup harmonies. 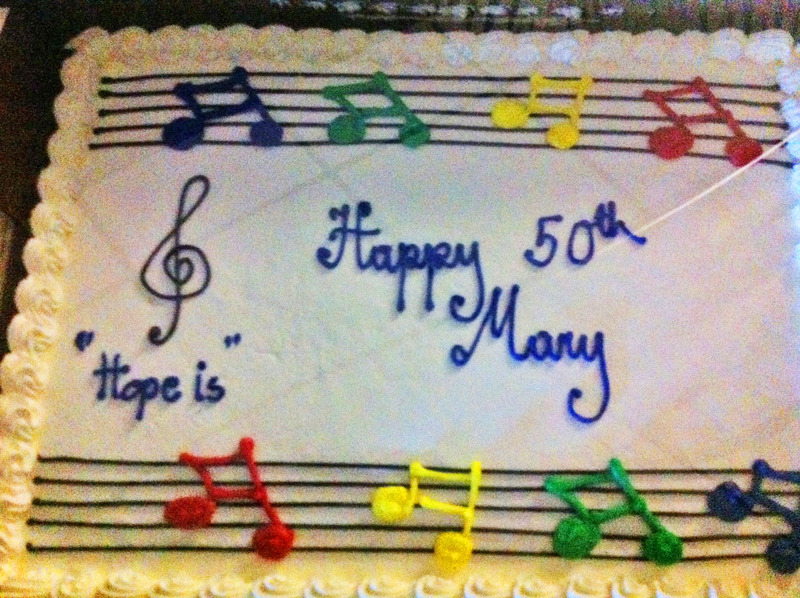 Of course we sang happy birthday with the audience and presented Mary with a cake. What an amazing honour to play with these great players. And SO incredible to play with Dominique Roy, our trumpet/keyboard player who came in from Edmonton..via his visit to Toronto to play for me. I flew in the great Albert Felicitas too from Edmonton to play keyboards as well and of course his wife, Paula, was also with us from Edmonton. Mary and Paula were beautiful as always with their perfect harmonies but we missed our sister, Pamela’s voice . ( Pam is in Vancouver at the moment) . All the planning, all the travelling, all the hiring and all the renting( or borrowing) of musical equipment is all worth it to me. The beautiful supportive smiles I witnessed while performing and the incredible comments I have received about the music make it all worth it. I am so lucky to have had Mary East by my side with regards to planning this entire journey and I had lots of help with the moving of all the equipment in and out of the various venues too. My husband, Terry, allowed me to chase this dream . Can you imagine how amazing it was to have Terry ‘open’ for me at the 4 largest shows and to stand near me with his beautiful bass playing and singing? And I know it isn’t ‘luck’ . The blessings I have received have been a hundred fold. Now my hope is that people that have received the new music from HOPE IS will find blessings too . Our world needs hope. We need to be that hope for others. Times will continue to be challenging in our world . But I believe that if we can ‘open the eyes of our hearts’ we will see the great love that God has for us . We might not be able to ‘ put our fingers in the wounds ‘ as Thomas did but we might do good to remember the words of Jesus, ” Blessed our those who have NOT seen and yet believe ” . There is great hope in these words.